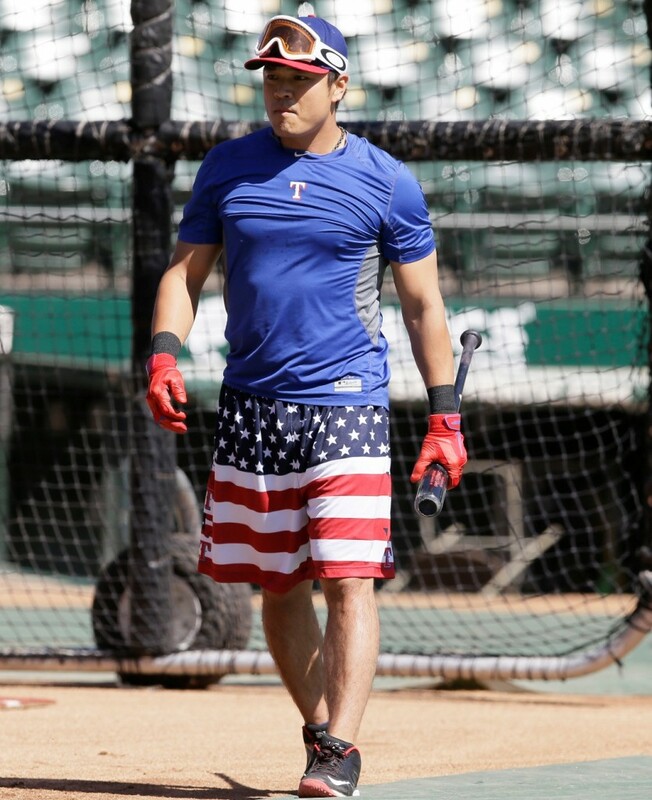 ARLINGTON, Texas (Yonhap) — South Korean outfielder Choo Shin-soo of the Texas Rangers said Tuesday the American League (AL) West champions have what it takes to come out victorious in the upcoming Major League Baseball (MLB) playoff series. Choo met with reporters at Globe Life Park in Arlington before the Rangers traveled north of the border to face the Toronto Blue Jays in the best-of-five AL Division Series (ALDS) starting Thursday. The Jays, the AL East champs, will host the first two games, before the Rangers return home for the third and, if necessary, fourth games. Choo, the AL Player of the Month for September, will be making his second postseason appearance, after playing in the National League (NL) Wild Card Game for the Cincinnati Reds in 2013. It ended in a 6-2 loss to the Pittsburgh Pirates, but Choo was one of the few bright spots for the Reds, as he homered and scored both of the team’s runs. Choo, who has homered in 27 big league parks but not in Toronto, said he’d like to add Rogers Centre to the list. The Rangers will send right-hander Yovani Gallardo to the mound in Game 1. He was 13-11 with a 3.42 ERA this season and went 2-0 in two scoreless starts against the Jays, spanning 13 2/3 innings. The Jays will counter with a Cy Young candidate David Price, who went 18-5 with a 2.45 ERA and 225 strikeouts in 220 1/3 innings. After joining Toronto in a deadline deal, the left-hander went 9-1 with a 2.30 ERA in 11 starts. Choo, who has traditionally struggled against lefties, has been solid against Price, with a .316 (6-for-19) career average and three RBIs. The Rangers will need Gallardo to once again keep the Jays at bay. Toronto led MLB with 891 runs, with no one else even plating 800 runs, and posted MLB’s best run difference of plus-221, 99 more than the next best team, the St. Louis Cardinals. The Jays tied for the best home record in the AL at 53-28. Their 232 home runs also topped the majors, led by MVP candidate Josh Donaldson, who belted a career-high 41 home runs and drove in 123 runs. Jose Bautista and Edwin Encarnacion had 40 and 39 homers, respectively. The Rangers ranked a distant third behind the Jays and the Yankees in runs in the AL with 751, and hit 60 fewer long balls than Toronto. Mitch Moreland and Prince Fielder each had 23 homers to lead the club, followed by Choo with 22.